Keeping track of activities within your organization is vital. In a typical business day, there’s a lot going on: phone calls, notes, emails, etc. How can you keep close track of these activities? Better still, how can you gain insight into what’s going on within the company? In Flexie CRM, you don’t have to. The system does it for you. Before we explain how can you view all history feed from a record, let’s briefly explain what’s a history feed in our context. History feed is a detailed timeline of all activities related to a specific record(which can be a lead, contact, deal, etc.) In other words, was there an email sent? Was the email opened? Was there any change made to information like email, phone number, country? Flexie CRM tracks these and every type of activity related to a record. In order to understand the record profile history feed, let us take an example. Suppose you want to know the history feed of a specific lead. First, go to Leads and on the drop-down menu click Manage Leads. If you have a lot of leads, you can use filters to find the lead you want. Once you find the lead, click on it. On the left side of the screen you can see all details about the lead. On the right side is what we call the history feed, a timeline of all activities related to the lead you’ve selected. To understand how the history feeds works, let’s say you go to the lead’s details and change the phone number.So you’ve just changed the phone number. Now, if you refresh the page you will see that the number has been changed, and the change is added to the timeline. Or let’s say you want to send an email directly from the lead profile.Once you fill in the fields and send the email, refresh the page. You will see the change in the history feed, the fact you sent an email. Every activity will be tracked and added to the history feed. If you go to Filters, you can choose what do activities do you want see in the history feed. 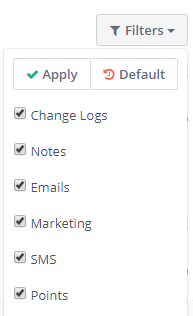 You can choose to view change logs, notes, emails, marketing, sms, points, etc. In the lead’s profile history feed, you will not only see the activity itself, but also the exact time when a sms was sent, when a lead’s detail was modified, etc. We illustrated the history feed with a lead, but you can see all activities related to deals, accounts, contacts, cases and custom fields. The history feed is a great way to keep close track of all activities within your organization. The more insight you have, the better decisions you can make.